RingCentral Inc. (RNG) came up during the fast-paced Lightning Round of Jim Cramer's Mad Money program Wednesday. Cramer responded to the caller, "That's a great team and I think that's a good stock." OK. Let's check out the charts. In the daily bar chart of RNG, below, we can see a strong chart that has outperformed the broader market in a number of ways. Prices have risen from near $60 in late March/early April to above $110 now -- not quite a double. The S&P 500 cannot claim that kind of performance. RNG outperformed in the fourth quarter as prices bottomed in November and made a higher low in December -- most stocks declined to make their lows in late December. During the fourth quarter pullback the daily On-Balance-Volume (OBV) line on RNG stayed steady, which suggests that longs held their positions and did not liquidate. The Moving Average Convergence Divergence (MACD) oscillator has spent much of the last twelve months above the zero line in bullish territory. In the weekly bar chart of RNG, below, we can see that prices are above the rising 40-week moving average line. The weekly OBV line shows strength the past three years and the MACD oscillator is in a bullish configuration. All bullish. 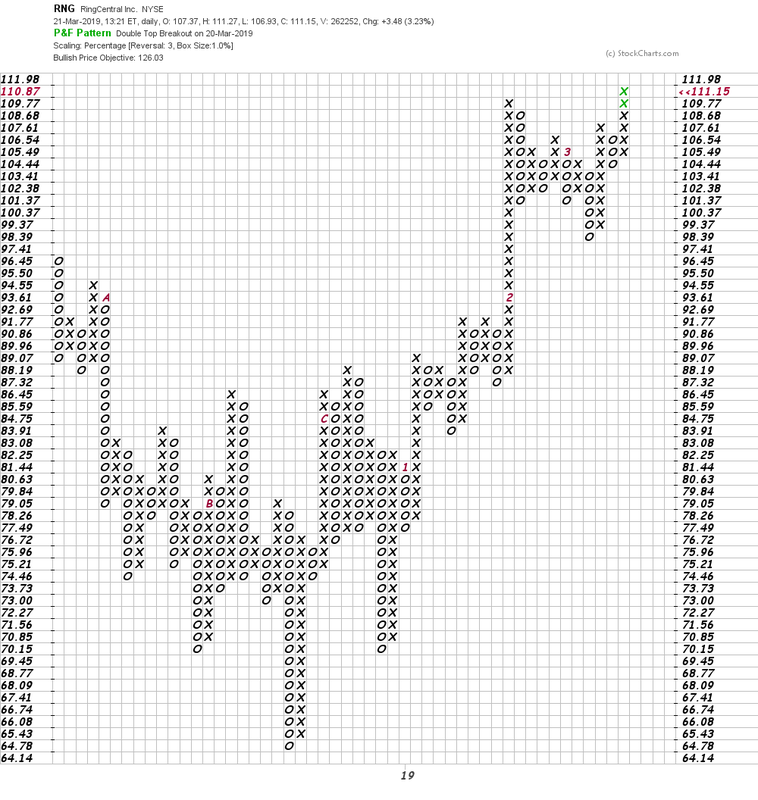 In this Point and Figure chart of RNG, below, we can see a price target of $126. Bottom-line strategy: It looks like RNG is pointed higher. Longs should hold with a sell stop below $95 for now looking for gains to the $125 area.